It was the best of times, it was the worst of times. I have held off on writing this edition of Hail Pelicus because I frankly didn’t know what to say. May 6, 2017. 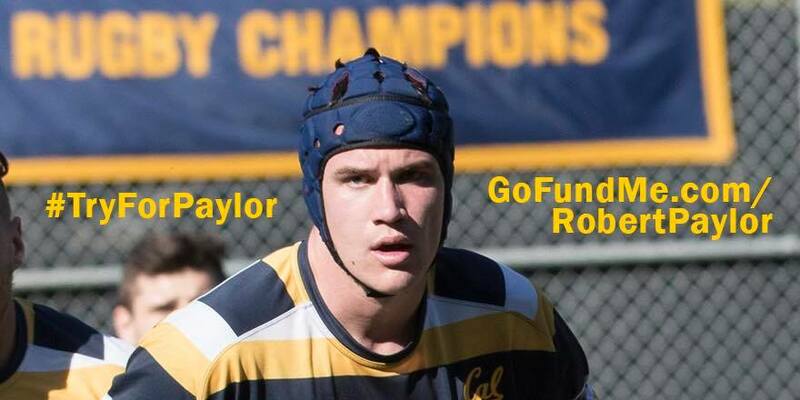 On a day when two Nor Cal colleges won national trophies and every Nor Cal team in playoff contention won my celebrations were subdued as I thought about Robert Paylor, the Cal lock who joined a rather innocuous maul that his Cal teammates were driving towards the try line. When everyone else got up he stayed down. Play continued and moved across the field and even back to within a meter of the trainers working with him before a new Cal surge put the ball over the line for a try. Paylor was still down and now it was apparent to all that something serious was happening. Rugby is a contact sport and no matter how much World Rugby, coaches, referees and players do to make the game safer there will always be a risk. The obvious dirty play resulting in injury is almost easier to process than the injury to Robert. One can process a punch, a stamp, a jumper taken out in the air and understand the injury. Joining a maul should not result in injury, but it did. Anyone who tells you that life is fair is lying to you. The California Golden Bears rugby team is many things to many people, but one thing everyone agrees on is they are well coached, well drilled and technically as good as anyone who plays the game. Body position, how to take contact, how to initiate contact; all are drilled to perfection. And yet. And yet. All I can say now is to treasure your time on the field. Treasure your time with the game. Treasure your time with friends and family. Rugby and life – always be grateful. All of our hopes and wishes for a full recovery go to Mr Paylor, a model athlete, a model student and a model human. We had a few more Pelican sides playing for titles. We will get to that in our next edition. Cal was able to recover from the loss of Robert Paylor early in the match to stamp their authority on the Varity Cup Final. Arkansas State was able to hang with the Bears for a half and were cruelly denied a try by a Nor Cal B Panel referee (AKA National Panel) who decided that he saw a knock on and didn’t need any help from the ARs. (Question: was a TMO available?) The 19-3 halftime score was misleading as the game was more balanced than that – the different being that Cal was able to cross the line and ground the ball more often when they got close and every time they did the referee agreed. The second half saw Cal take control of the game at their steady, professional best. Arkansas St rarely saw possession for more than a few phases and were generally shut down. The goal kicking of Russell Webb was rock steady as he reportedly used a technique suggested by assistant coach Tom Billups to sing a song to himself as he kicks. This acted as a relaxer and a timing mechanism and he struck the ball like clockwork every time. Neither party elaborated on what the song was but the keen lip-reading of the Hail Pelicus staff can confirm the rumor that is was Miley Cyrus’ “Party In The USA”. St Mary’s and Life University have been locked into the top 2 spots of D1-A ever since Cal and BYU pulled out to form the Varsity Cup (which BYU has been booted from so that just goes to show). The result of this dynamic means that the last 5 years have been head to head matchups of the Beast From The East and the Best Of The West. Last year Life West won in a tight, hotly contested match and this year looked to be more of the same and the game did not disappoint. Once again a Nor Cal B Panel referee was in charge with more than able help from Pelicans to make him look good. The game more than matched expectations as a nervy start saw a few knock ons and mistakes. It soon settled into the back and forth affair everyone expected with each side pouncing on mistakes and creating chances. Life scored an early try but the response was immediate from the Gaels as they hit back with 2 penalties and a try to take the lead. Both sides traded punches (figuratively) throughout the rest of the half which ended with a 17-16 scoreline in favor of the Running Eagles. The second half started much like the first with Life scoring an early try but St Mary’s was not to be denied. Vili Helu started asserting himself, making big hits and long runs while the St Mary’s pack took control of the scrums. The final score came when Helu had to leave with a shoulder injury but the Gael scrum didn’t miss a beat. With St Mary’s holding the slimmest of 1 point leads Captain Kevin O’Connor took the ball from the #8 position and launched himself downfield. One pass later to a man in support and the Gaels are under the posts. Final score: 30-24, St Mary’s over Life. The last edition of Hail Pelicus misidentified Rob “No Pelican Name” Hendrickson as Ed “No Pelican Name” Barfels in the This Week’s Photo section. While we, the editorial staff at Hail Pelicus, take full responsibility for this error we must point out how difficult it is to distinguish between the various Pelicans without an official Pelican Name to help. The lesson here: if you want us to get your name right, then get your right name. On a very hot day in the Oakland hills, Bishop O’Dowd’s full roster and ability to move the ball quickly back and forth across their narrow (football) field made all the difference. They started scoring within the first two minutes, with their second as a penalty try plus yellow card for the Sacramento 13, as the last defender, clobbering a flying BOD winger around the neck. There was some parity for parts of the match, but it was largely one-way traffic. Sacramento had several players show up right at kickoff time, which couldn’t have helped much either. We decided to stop counting with 15 minutes left in the match so that Sacramento could re-use some substituted players who didn’t get much time, and the final (unofficial) result was 65-12. Thanks to the BOD crew for the excellent catering afterwards! Those lunch selections rivaled what I’ve seen in France, sans the wine of course. O’Dowd kept the match close for the first 20 minutes with strong play by a their captain. A skilled loose forward, she advanced the ball well for O’Dowd and made many of the tackles on defense. Land Park was more cohesive in their team play and that was the difference. They put together good phases of attack and found gaps in the O’Dowd backline. Wow what a scorching Saturday in April. A classic San Francisco match up, Olympic club versus Golden Gate. Unfortunately told all their players to go home and their season was done a week prior. But the match was played regardless of such matters. The first half of the game was completely controlled by Bellarmine. They scored 3 quick tries and converted one of them to go up 17-0, and they continued to apply pressure throughout the half. Chico tried to run a pick-and-go style game, but the Bellarmine defenders beat the runners back on every play. Chico was definitely on their heels, and about 15 minutes into the first half, I yellow carded Chico 8 for a dangerous tackle. The Chico 8 came back in with 10 minutes left and helped to put Chico on the board with a minute left in the first half. The second half, Chico came out with new energy and passion and applied serious pressure to the Bells. The Bells started making a large number of unforced errors including leaving their feet in rucks, not rolling away, and a large amount of knock ons. This gave Chico the edge, and they were able to put up 24 more points to take the cup 29-17. Sunny San Francisco on championship weekend. Two teams fought for the right to travel to Arizona and the elite 8. This was an incredibly close and hard fought match that was back and forth. Eugene kicked off the scoring with a penalty goal thirteen minutes into the first half. Eugene had the upper hand and threatened for large periods of the this opening quarter, but Chico’s defense stood strong and only relented the three points. Chico broke through the Eugene the defense for a converted try, and going into into the half leading. Eugene 3 – Chico 7. The hard contest continue and was unrelenting in the second half. Chico was able to consolidate their lead with another converted try. They extended their lead, with roughly 30 minutes remaining Eugene had plenty of time to narrow the margin. Eugene’s retort came not too long after. They converted and brought the score to Eugene 10 – Chico 14. With spare minutes on remaining in the match Eugene attacking within the Chico 22. With numbers wide Eugene spun the ball, but Chico’s defense came up quick, forcing a pass that tragically caused the game to end. Eugene fell a few meters short. A narrow pitch played into the hands of the Amazons, whose forwards kept it tight and ran straight. Land Park’s speedier backs had insufficient room to play, and thus went the contest. A sunny afternoon on Treasure Island, mercifully cooler than the temperatures we’d seen earlier in the week, saw ORSU face SFGG in the Men’s D1 ACR1 playoff, for the chance to play in the national quarter finals. SFGG’s defense was smothering, their ball carrying ferocious, the surfeit of talent, pace, and creativity in the backs was a joy to behold, and Volney Rouse’s kicking was solid despite the stiff breeze. ORSU gamely played positive rugby throughout in the face of an onslaught of attacking rugby and fought to within inches of SFGG line on several occasions, but the visitors were unable to convert the pressure to points in the end. SFGG’s commanding win came in spite of being heavily on the wrong end of the penalty count, and their discipline at the breakdown will need to be better in their quarter-final match against Austin Huns. Thanks to both teams, and to Jessica Turner and Jeff Richmond for their assistance on the touchlines, and Mike King for his help as #4. Emerald City scored an early second half try to bring the score to 14-10. However, SFGG was able to maintain more possession scoring an additional penalty goal and converted try. Oddly, Emerald City’s pack was clearly dominant in the final 15 minutes resulting in several turnovers within SFGG’s 22. Unfortunately for the visitors, this pressure was not enough. Kudos to both teams for an enjoyable match, and to Jeff Richmond, JT Turner, and Eugene Baker for their assistance. The Brits were coming into the game having won all their matches so far on tour. However they had not faced off again Life West yet. The confidence waned quickly. The British were outmatches by the organization and physicality of Life West’s side. The British Army touring side was a treat to referee. Good luck on the rest of tour. This entry was posted in News on June 9, 2017 by James Hinkin.